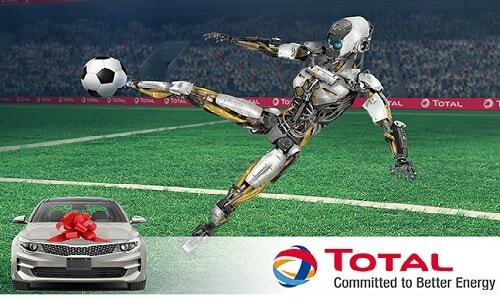 Total, an official sponsor of the African Cup of Nations is using this medium to reinforce her commitment to promoting African football and launch Totals new and improved mascot - Roboquartz 4. • The participant directly finds on a new page whether he wins or loses. • Either via Facebook, he will thus have to comply with Facebook terms and conditions of use. • Either via Twitter, he will thus have to comply with Twitter terms and conditions of use. • Either by copying the link and sharing it via email or any instant messaging means. There shall be 3 (three) Winners daily. the game and shall be entitled to one prize. value, especially in the event of the unavailability of the endowment initially planned. immediately and a confirmation of his/her quality of winner is sent to him/her by email. informed of the procedure to follow to get his/her prize. If you have any question regarding the TOTAL CHAN CHALLENGE PROMO kindly join the conversation and I will be happy t answer your questions.